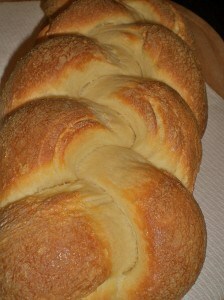 Braided Swiss Bread Recipe | Good. Food. Stories. Although I grew up in Westchester, New York, I was born in the small Swiss mountain town of Vevey during one of my family’s stops around the globe as part of my dad’s work for Nestle. I was only 9 months old when we moved away, but Switzerland has stayed with us—particularly in the kitchen. Our time in Vevey and the deep Swiss roots from my grandparents, aunts, uncles and cousins have defined our family to this day. We put candles on our Christmas tree and use old ski socks for fireplace stockings as Swiss holiday tradition dictates. I love to ski—most of the Swiss do too. I have an impressively high threshold for large quantities of melted stinky cheese after growing up with deliciously gooey Swiss meals. I adore good quality chocolate, from Nestle (of course) to Toblerone and Teuscher. And the Hoch family’s Swiss culinary specialties run the gamut from smooth raclette and fondue to creamy veal geschnetzeltes, from crisp potato roesti to spicy Christmas cookies, and oh so many hazelnuts! But for now, the blustery cold wind whipping through Brooklyn makes me want warm, rich, eggy bread, the kind I remember my dad making by hand on Sunday mornings. We always ate it warm for breakfast, with honey butter (room-temperature butter blended with equal parts honey), which is so damn good. But this could also accompany a hearty stew, some soft cheese and fig spread, or any charcuterie, really. We call it Tresse, French for “braid.” But any way you slice it (hee), I promise you’ll love it. I recently made a loaf for a Food-You-Grew-Up-With themed Glory Salon, and got some happy reviews. In a small bowl, gently stir the yeast into the lukewarm water and let it stand until the yeast “blooms,” about 5 minutes. You’ll see the surface of the liquid becoming slightly frothy and opaque. While the yeast is blooming, in a large bowl, combine the lukewarm milk with the sugar, salt, whole egg, and egg yolks. Stir in the dissolved yeast mixture, then gently mix in the flour until almost fully incorporated. Turn the dough out on a heavily floured board and knead until the dough is smooth and elastic, about 10 minutes. (Be careful, it’s super sticky!) Lightly grease a large bowl with vegetable oil and move the kneaded dough to the bowl, rolling gently to fully grease the dough on all sides. Cover with plastic wrap and let the dough rise in a warm area until doubled in bulk, at least 2 hours. Punch the dough down and cut into three equal pieces. On a lightly floured board, shape each piece of dough with your hands into a 14-inch long rope. Put the three ropes on a greased cookie sheet and braid them as you would hair (pinching the ends and tucking them under to keep the braid intact). Brush the braid with melted butter. Let the loaf proof (rise once more until doubled in bulk), about an hour. While the dough is proofing, preheat the oven to 375 degrees F.
Brush the egg wash over the risen loaf. Bake the loaf for 25 to 30 minutes, or until deeply golden brown.